A contemporary interpretation of a classic design, the Marin world globe's floor stand is hand-crafted from wrought iron with a rustic textured finish. 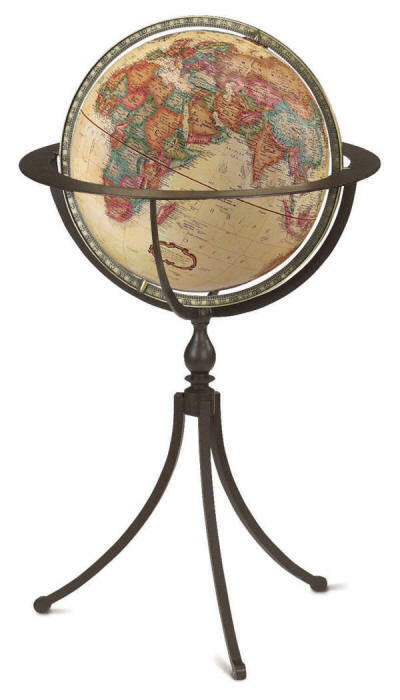 The distinctive metal stand beautifully spotlights the 16" raised relief globe. Full-swing antique style brass-plated die-cast numbered meridian (ring supporting the globe) allows for 360° view of geographical points of interest on the map. The globe revolves within the meridian (East/West), and the meridian swings within the stand (North/South). A dramatic choice for home or office.